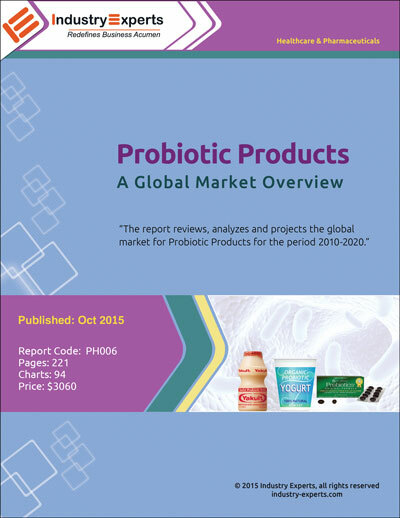 Industry Experts has released the new market research report on probiotic products. The new global report ‘Probiotic Products – A Global Market Overview’ reveals that the market for probiotics in North America is forecast to be the fastest growing with a CAGR of 11% between the analysis period 2015 and 2020 to reach US$9.7 billion by 2020 from an estiamted US$5.7 billion in 2015. Increased demand for probiotics on a global basis can be attributed to a number of factors. The vibrancy and innovativeness in the market for functional foods, beverages and dietary supplements is being propelled by greater awareness about the role of microorganisms in promoting good health, sustained clinical research and the utility probiotics can offer. Worldwide, demand for probiotics has been on an upswing, with a study confirming that 19% of respondents in the US claiming to have digestive concerns consuming probiotics in one form or the other. Even more crucial is the fact that 7% of the consumers who have not had digestive problems have reported taking probiotics. Primary benefiters of this trend have been the functional food/beverage and supplement markets, with recent times witnessing a slew of product launches and increased sales. A major driver propelling demand for probiotics has been that though their attractiveness encompasses a broad and ever-expanding demographic, women, in particular, are seen as being the principal force behind growth. Female consumers are influencing buying decisions for probiotics to maintain their families’ health and the high level of interest in digestive health ranges all the way from Baby Boomers to Millennials. A greater number of studies being published as to the beneficial effects of probiotics have increased awareness among consumers in regard to the benefits of these beneficial bacteria, more so for supporting children’s health and women’s health. Research has indicated that the use of supplements among women is marginally higher than men in virtually all categories of specialty supplements, apart from sports performance. Women tend to gravitate towards supplements that help in maintaining immunity, energy, bone health, mental functions and sleep, with immunity for their children topping the list. The market for Probiotic products analyzed in this study includes Probiotic Foods & Beverages, Probiotic Supplements and Probiotic Animal Feed. The report analyses the market in terms of market value. North America is projected to be the fastest growing market for probiotic products with a CAGR of 11.4% during the analysis period 2015-2020. Asia-Pacific is estimated the largest market in 2015 with US$15 billion and is expected to touch US$16.3 billion in 2016. The report reviews, analyses and projects the Probiotics market for global and the regional markets including North America, Europe, Asia-Pacific and Rest of World. The regional markets further analyzed for 14 independent countries across North America – Canada, Mexico and the United States; Europe – France, Germany, Italy, Spain, Sweden, Russia, the United Kingdom; Asia-Pacific –China, Japan, India, South Korea. This 221 page global market report includes 94 charts (includes a data table and graphical representation for each chart), supported with meaningful and easy to understand graphical presentation, of the market. The statistical tables represent the data for the global market value in USD by geographic region and product type. The brief business profiles of 27 key global players and 31 major players across North America – 13; Europe – 12; and Asia-Pacific – 6 are included in the report. The report also includes the list of companies engaged in production and supply of probiotic ingredients, probiotic supplements, probiotic animal feed and probiotic foods & beverages. The list covers the address, phone numbers and web addresses of 144 companies.